Navigating the journey to publication is all about making choices. The many decisions you make as a self-publisher influence other decisions down the road. One of the earliest decisions you need to make is the kind of print production you’ll be using for your book. 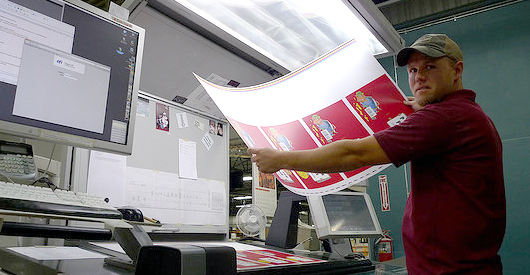 Of all the printing and reproduction methods available to you, which will you choose? How can you decide what’s right for your book—and your budget? Should you use digital printing with print-on-demand distribution? Is your book more suitable to offset printing and physical fulfillment? Who is the market for your book? And what are the different ways to get a book into print? That would be good to know. Understanding these options is key to making good decisions. Here are some articles that address reproduction and the choices you’ll be making. First you’ll need to understand the various ways books are printed, and how to determine the best method for each kind of book. You can start with a quick introduction to printing processes. Once you decide how to print and distribute your book, you’ll face the choice of picking an offset or print on demand printer. And for specialty books, sometimes you need specialty printers. Every self-publisher needs to understand digital printing and print-on-demand distribution, because it’s becoming the favorite method of printing for people who want to limit their investment in inventory. This form of distribution also makes the publishing, distribution and fulfillment process labor-free for the publisher. This one change in book printing has been the catalyst for the explosive growth of self-publishing, and for finally enabling books to continue “in print” indefinitely. Self-Publishing Basics: Print on Demand: What Is It? One of the first questions from new self-publishers is “How much is this going to cost me?” The answer from most professionals is “Well, that depends . . .” In an attempt to give you a range of figures, I’ve broken down self publishers into three different kinds, and looked at a range of prices in nine categories for each. Studying these articles may help you decide which is the right route for you. By this time you’ve done your research and picked a printer for your book. In that decision you’ve also chosen how you’ll distribute and fulfill the orders for your book. All these decisions are influenced by the early work you did on figuring out the market for your book. Fine art books will need one type of production, self-help books need quite a different kind. Publishing for the online market imposes different requirements than publishing for national bookstore chains, or for back-of-the-room sales. Your publishing venture stands the best chance of success if you address these questions from the start. And now part of our planning is for the growing field of Ebooks and Ebook readers. That’s where we’re headed next.